The PreThinking blog has posted a new set of WebOS screenshots. The screen grabs appear to have been taken from an early release of the WebOS SDK emulator running on a Mac. The 15 shots show a number of different apps and informational menus. The Google maps application is shown as is a number of other screens such as the Preferences and Phone Info and the ringtone settings. I was looking through the screenshots, and they look pretty clean. 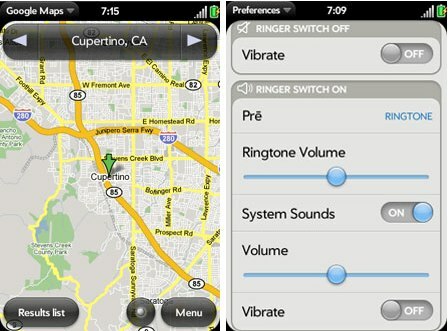 I refrained from commenting on the arrangement of settings, sliders, and switches looking very similar to the iPhone. But then I realized Google Maps was pointing to Cupertino, CA. Seriously, what the hell? If Palm wants this thing to be successful, I think they want to stay as far away from the iPhone as possible. So please, whoever is leaking these things, try to refrain from setting pushpins on Apple HQ. Perhaps because it was running on a Mac? Maybe it was running on a Mac at Apple HQ.